2007 Rolls Royce Phantom Drophead Coupé ! Rolls Royce Phantom Drophead Coupé ! Built without compromise, it encapsulated a century of elegance and engineering, and, in an instant, defined the future direction of the brand. 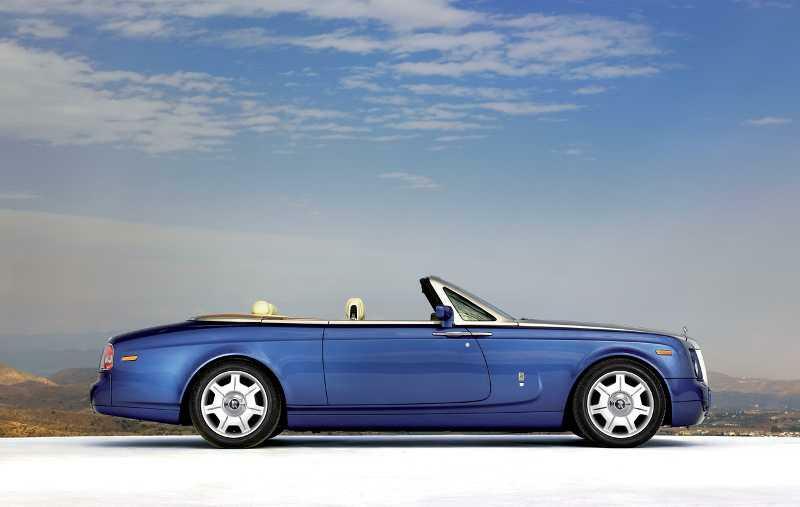 In 2004, Rolls-Royce unveiled 100EX, a striking experimental drophead built to celebrate 100 years of arguably the most famous automotive brand in the world. In its two world tours, 100EX garnered positive comments from customers and the media alike. 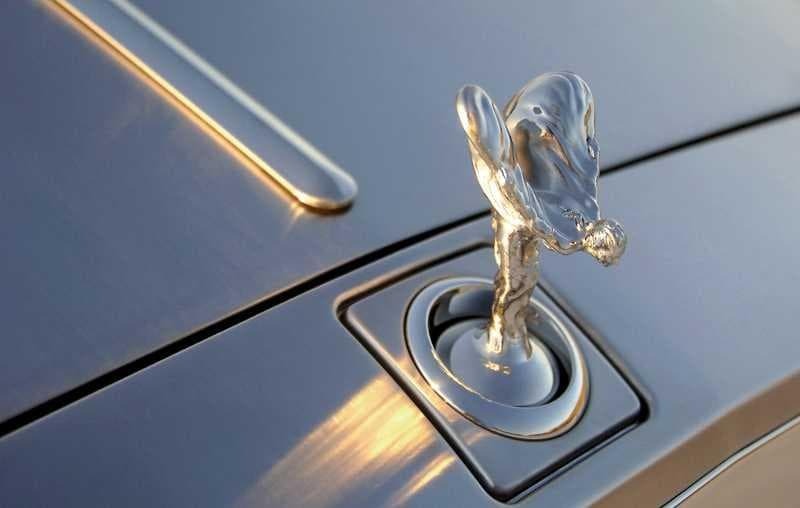 Such was the strength of the reaction that, in the autumn of 2005, Rolls-Royce announced that a production version would be available by 2007. In the interim years, the team at Goodwood have worked tirelessly to turn the experimental car into a reality. 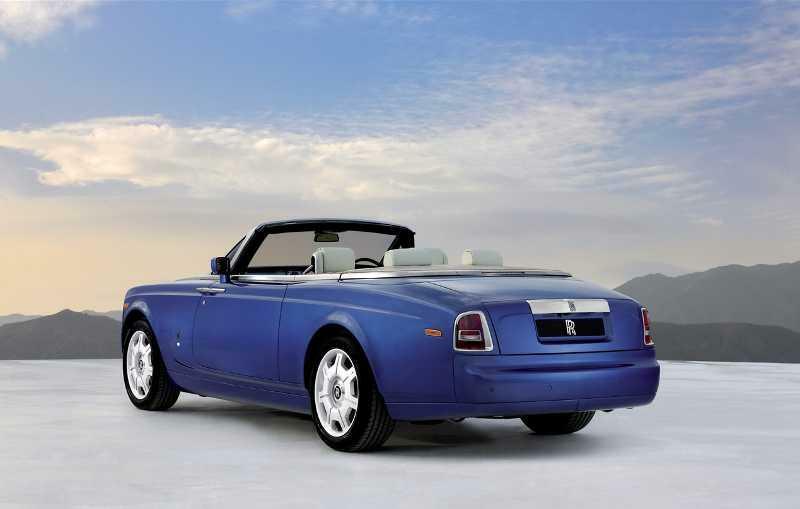 Launched at the Detroit Motor Show 2006, the Phantom Drophead Coupé is the second new model from Rolls-Royce since BMW Group became custodian of the marque in 1998. 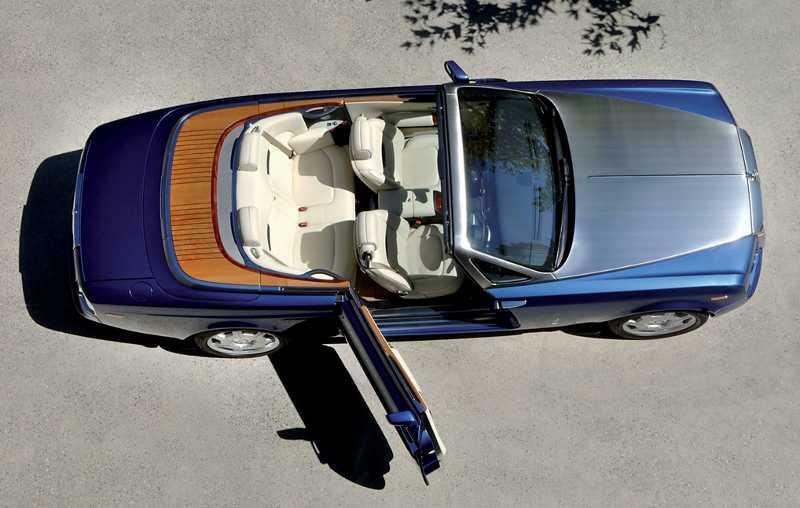 The two-door, four-seat convertible is a less formal interpretation of classic Rolls-Royce design. Using the lightweight rigidity of an all-aluminium spaceframe, it marries modern technology to a sleek, streamlined convertible body. 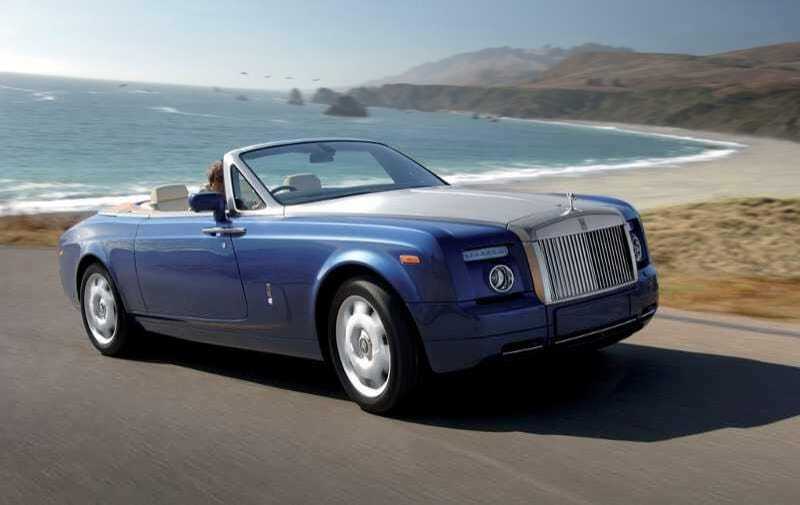 The Phantom Drophead Coup has been carefully crafted to be aesthetically pleasing, yet practical too. Its exterior lines echo the timeless styling of the great Rolls-Royce cars : a long bonnet, large-diameter wheels, short front and long rear overhangs and the quintessential dynamic line descending along its flanks. Inside, the design emphasises the airy openness of top-down motoring, embracing the elements and creating a stunning, social environment. Wood, leather, chrome and brushed steel have been used where most appropriate. Form and function have equal billing. The simplicity of the design belies a car built to provide years of effortless service. The Phantom Drophead Coup offers owners an unparalleled convertible experience, combining compelling driveability with exceptional engineering, technology and design hand-crafted from the finest materials to an exceptional level of quality. 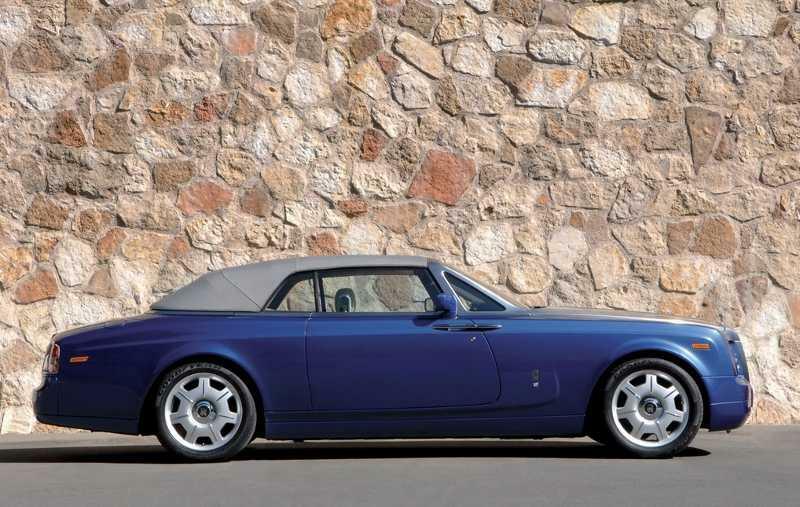 From the outset, the design team at Goodwood were adamant that the Phantom Drophead Coup should be more than simply a convertible version of the Phantom. Designing without compromise meant that, to a certain extent, we had to start again, says Rolls-Royce Chief Designer Ian Cameron. Simply removing the Phantoms roof could have made a great convertible but it wouldnt have made a perfect one. 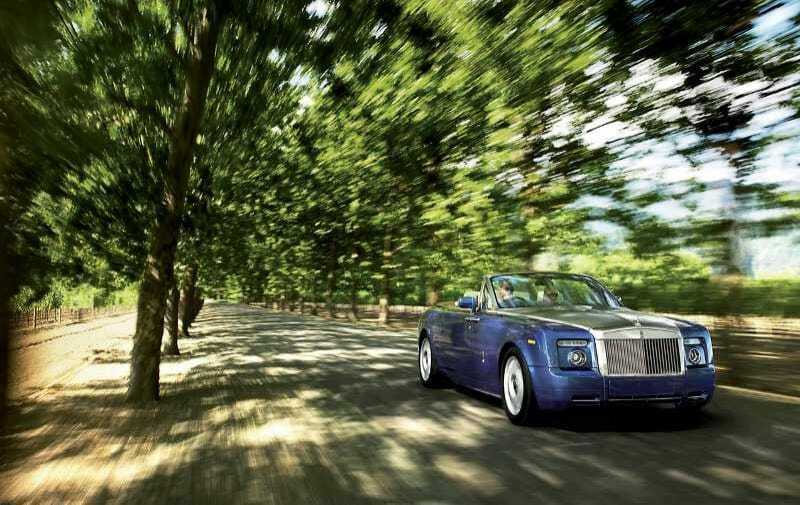 With the Phantom Drophead Coupé we had the chance to think about the very nature of convertible motoring and, in particular, what it means to Rolls-Royce. Every exterior panel on the Phantom Drophead Coupé is new, echoing the Phantoms style but with carefully considered proportions more suited to the shorter body. 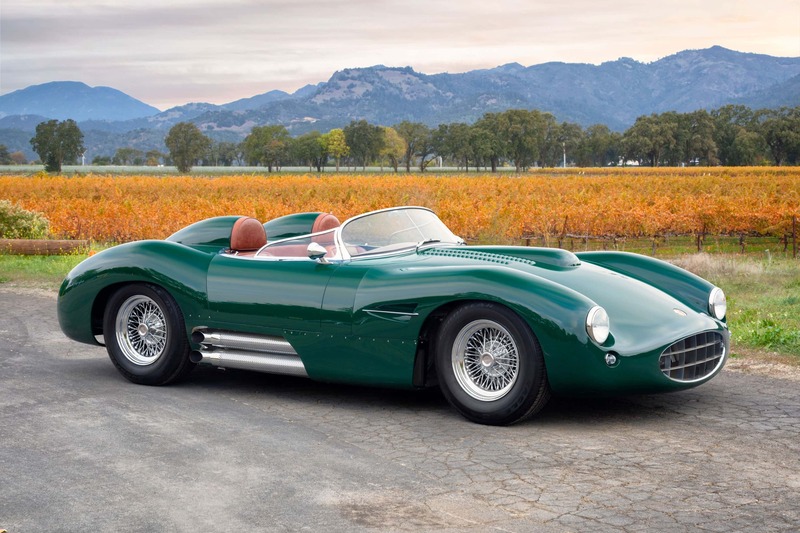 From the raked front end to the sweeping rear, every aspect was studied at length to ensure that the finished car looked purposeful and elegant both with the hood up and with it stowed. For the interior, the concept was simple: bring the outside in. Create a social space enabling occupants to embrace the elements using sumptuous, relevant materials. The entire team was keen to keep things as natural as possible and, as a result, there is an instant, raw beauty to the Phantom Drophead Coupé. As well as considering the details of the package seating arrangements and dashboard layouts, for example the designers also developed some fundamental beliefs about how the materials they were using should work. Materials are used in a way that emphasises their natural charm and there is an immediacy to the exposed elements of brushed steel and solid teak. Bleaches, stains and lacquers were shunned as far as possible in favour of more natural finishes. Hands touch only chrome, leather or wood. Other materials, such as the brushed steel, are used as architectural detailing, giving the whole car a sense of visual tactility. 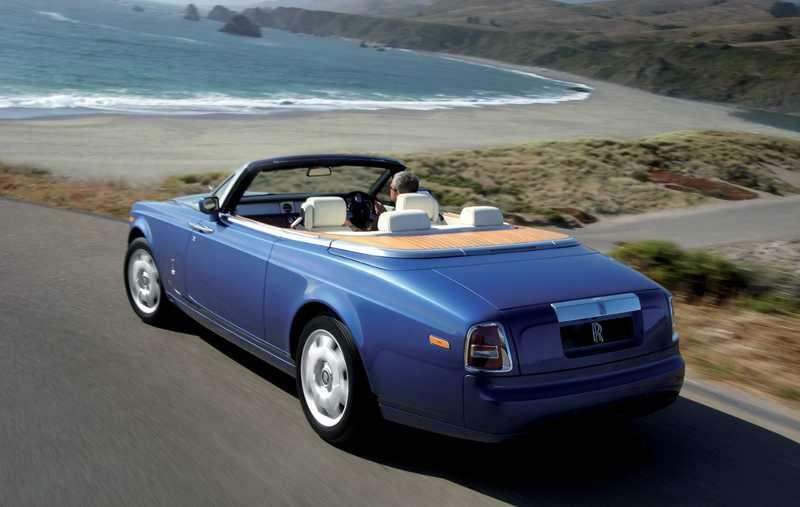 The Phantom Drophead Coupé is about emphasising the essentials of pleasure, says Cameron. Above all, we were determined to make this car a joy to live with. Rolls-Royce is the opposite of stiff formality. 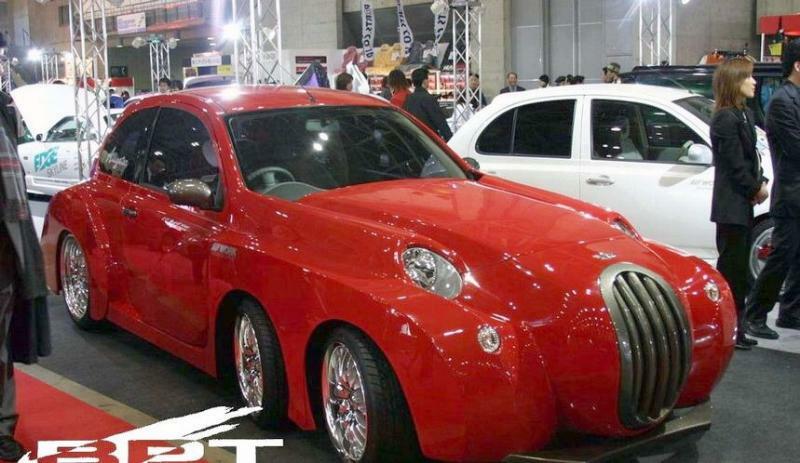 Why would you design and build a car like this and not make it fun to use ? The profile of the Phantom Drophead Coupé is fundamentally transformed from that of a conventional four-seat convertible by the inclusion of front coach doors. Evocative of the classic sports car profile, they add considerably to the easy entry and exit of rear passengers. 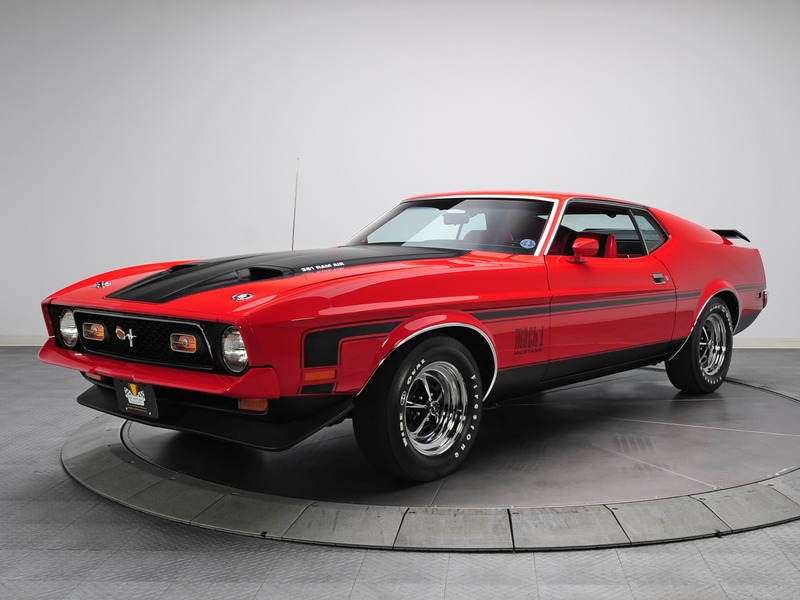 Perhaps just as importantly, they also add significantly to the overall strength and stiffness of the body as they allow the construction of an uninterrupted A-pillar. 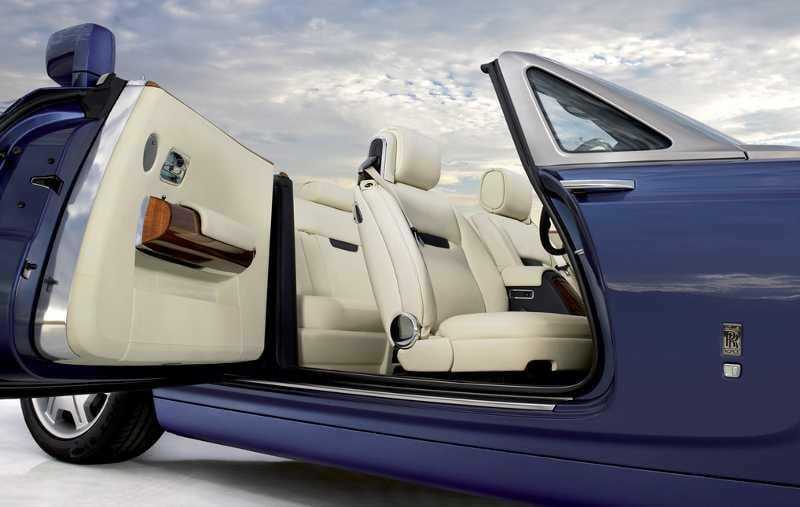 Newly homologated for the Phantom Drophead Coupé, these coach doors are unique to Rolls-Royce. 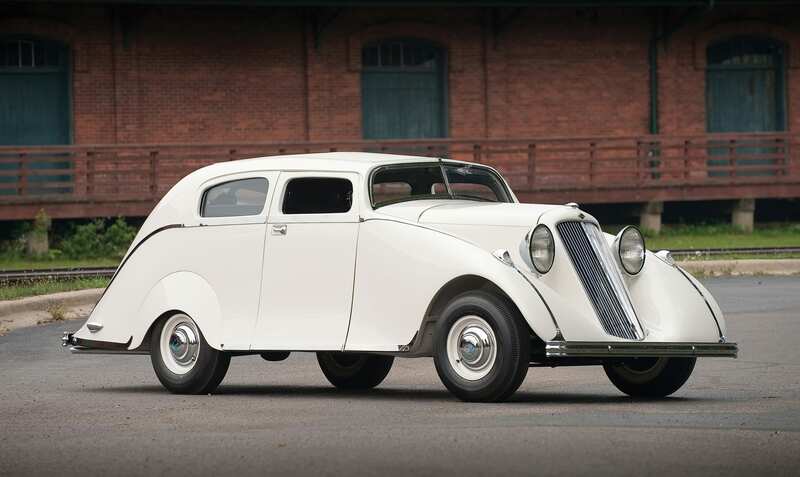 At the front sits a new, more rakish grille, giving the car a more casual air while retaining its classic looks. Finished in steel, the centre fins are polished while the surround is brushed to match the optional brushed steel bonnet and A-pillar. The grille is hinged at the top in order to give way in the event of a low-speed impact. On top sits the Spirit of Ecstasy, remodelled using advanced computer software. These days she has a more lifelike appearance, with clear definition of her features. Finished in stainless steel, the Spirit of Ecstasy is also available in silver or gold via the Bespoke programme at Goodwood. Slim front LED side lights sit above larger round driving lamps. 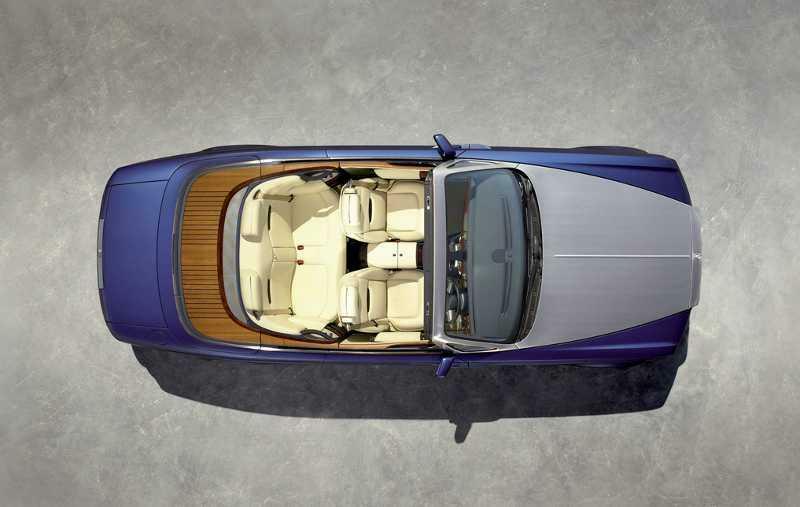 The front end of the Phantom Drophead Coupé is more streamlined than that of previous Rolls-Royce cars. The front bumper is integrated into the design, further softening the look. A discreet camera nestles underneath the numberplate to provide an excellent split-screen view of the road ahead, via the on-board monitor, to help when parking or when pulling out of a side road. 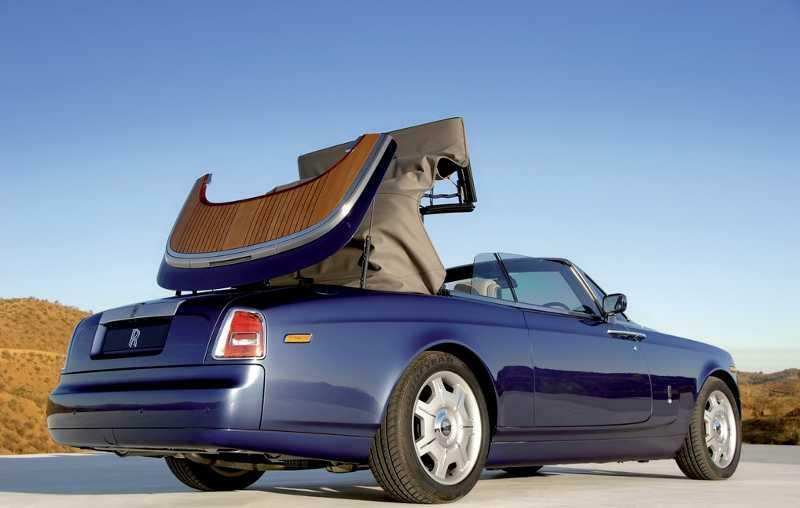 One of the best visual clues to the Phantom Drophead Coups character can be found at the rear. 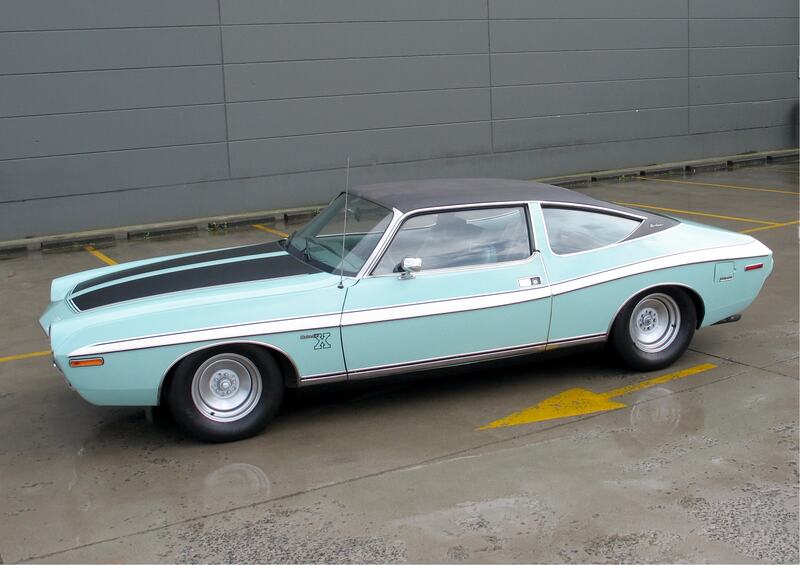 The picnic boot is the very essence of automotive affability. The only type of its kind on any convertible, it offers easy access to the luggage compartment as well as providing comfortable outdoor seating for two adults. The substantial hinges are able to accommodate a weight of 150 kg / 330 lb. Inside the boot, 315 litres / 11.1 cu ft of space is enough to house three sets of golf clubs. Importantly, this space remains intact whether the hood is raised or lowered. Two of the most visually stunning options are the teak decking for the rear hood cover and the brushed steel bonnet and A-pillar. 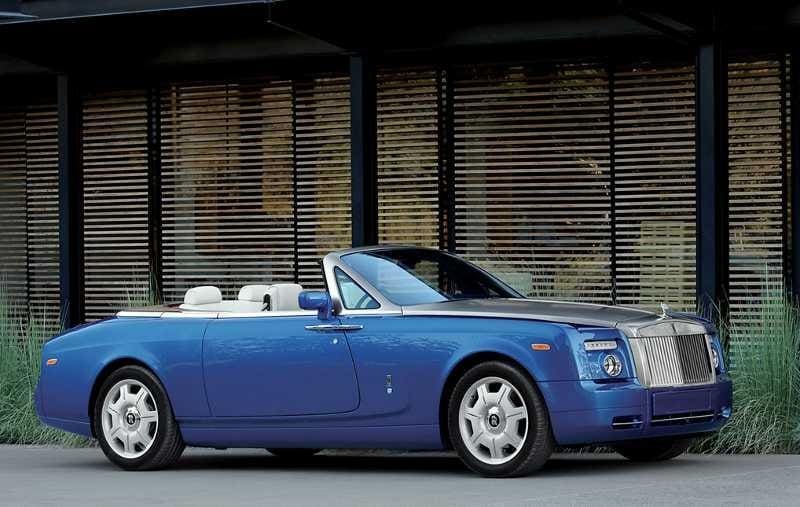 An entirely new palette of nine exterior colours has been developed for the Phantom Drophead Coupé : Metropolitan Blue, Admiral Blue, Jubilee Silver, Diamond Black, Duck Egg Blue, Semaphore Yellow, English White, Woodland Green and Ensign Red. These are complimented with hood colours in Silver, Black, Beige, Navy Blue, Deep Red and Deep Green. First seen on the 100EX experimental car in 2004, these are signature elements of the Phantom Drophead Coupé look. The brushed finish of the bonnet and A-pillar apes the classic Phantoms of the 20s and 30s but with a delightful 21st century twist. 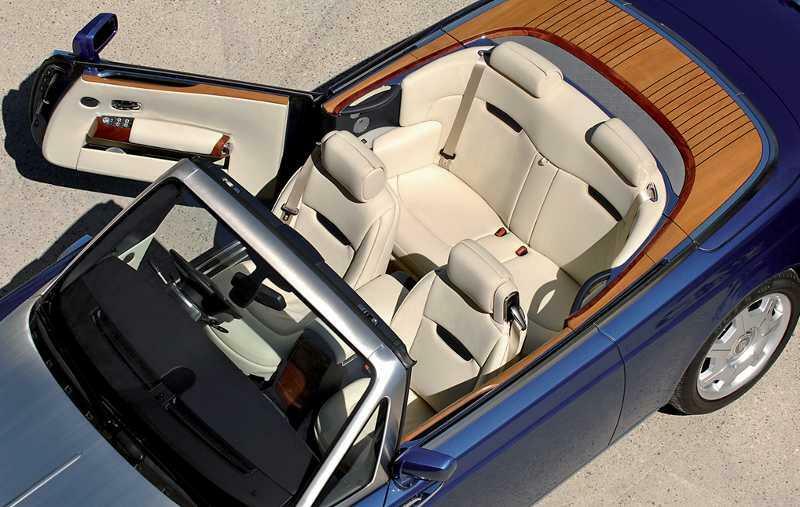 The rear teak decking epitomises the careful design and attention to detail seen throughout the Phantom Drophead Coupé. It is as functional as it is beautiful. Teak was used because of its inherently hardy properties and its resistance to moisture and decay. Special techniques were developed in the Rolls-Royce wood shop to preserve the appearance of a fresh, unprocessed finish, the aim being to have a final deck that was as close to natural timber as possible. We wanted it to look as if it had been cut and hand-finished 10 minutes ago, said Alan Sheppard, Chief Interior Designer. More than 30 individual pieces of teak go into each deck, protected by a specially formulated blend of oils. 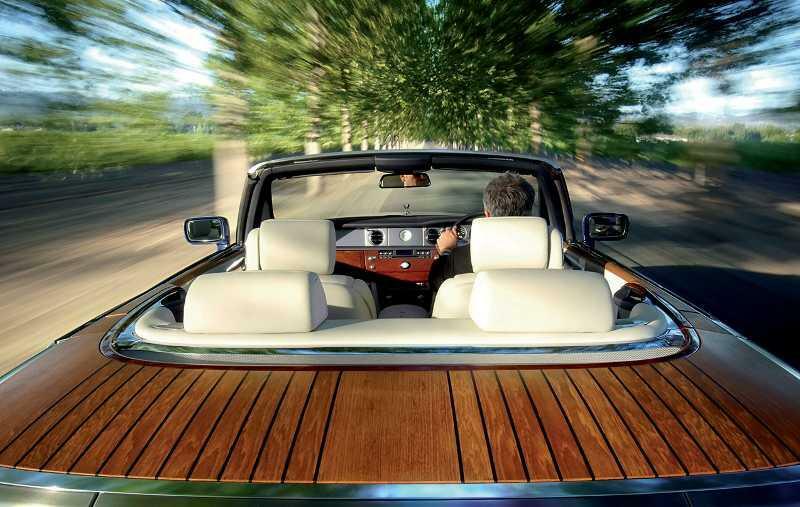 As with all the woods and veneers used by Rolls-Royce, it is sourced from sustainable forests by a team of specialists. 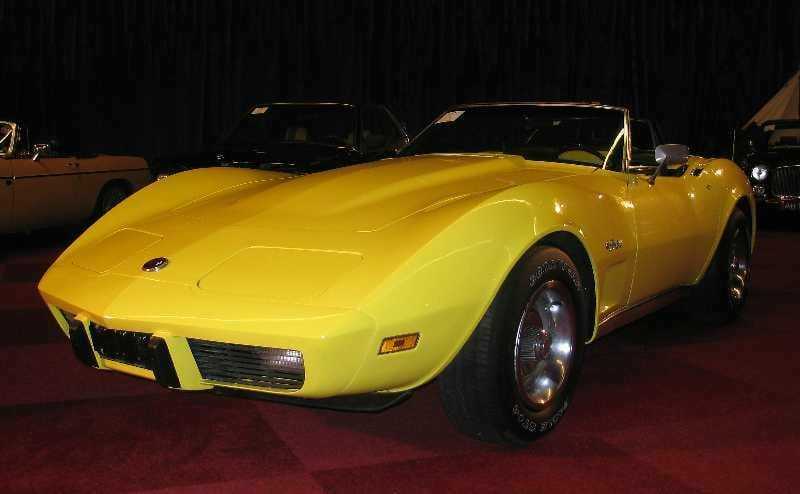 The hood is the largest of any modern convertible. Its acoustic insulation is exemplary, with five layers of insulation material between occupants and the outside world. Lined with a cashmere blend, the structure is more like a bespoke suit than a traditional fabric roof. 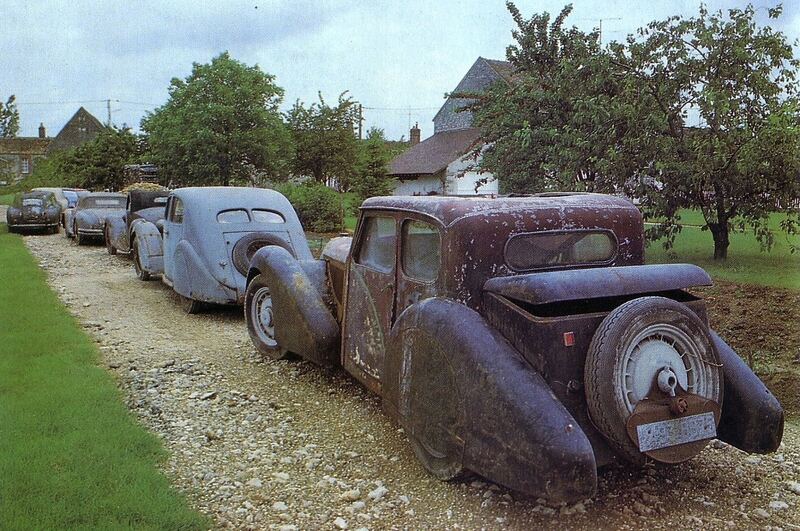 Rolls-Royce was keen to use a fabric roof rather than a folding hard-top for many reasons, not least aesthetics. As Ian Cameron describes, there is nothing more romantic than driving a convertible in the rain at night and hearing the drops hit the roof. In conversation with our customers we realised that they felt the same way. 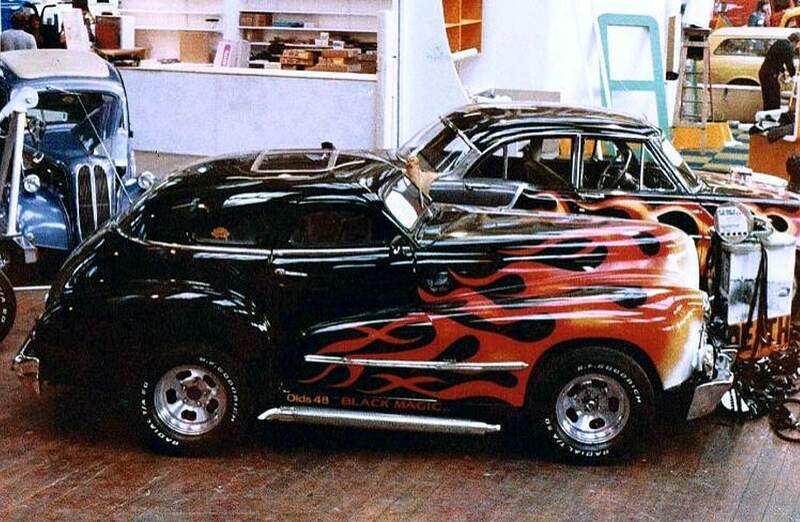 A further benefit of the tailored, soft-top roof is the relatively small space required to stow it. The interior concept revolves around the idea of an indoor/outdoor space : an all-weather passenger compartment that combines the practicality required for convertible motoring with the sumptuous elegance expected of Rolls-Royce. Rather than take inspiration solely from the automotive world, Chief Interior Designer Alan Shepherd looked elsewhere. In 2004, when we were designing 100EX, we visited a boatyard in Southampton where one of the famous 1930s Americas Cup J-class yachts was being restored. We were struck by the variety and uses of different materials throughout. All of the J-class yachts have a tremendous sense of purposeful elegance about them, and this was something that we were keen to emulate. 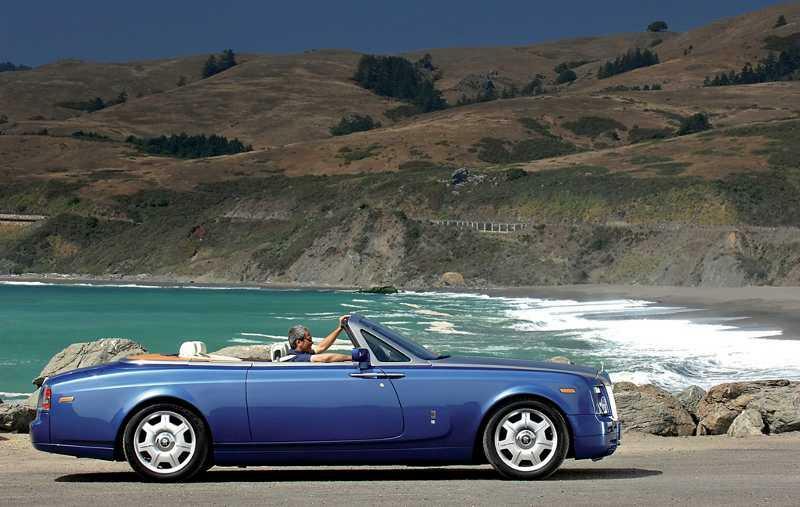 The Phantom Drophead Coupé has been designed as a car in which to enjoy the elements. The all-weather surfaces of the interior have been designed to take what nature can throw at them. We didnt want owners to feel as if they had to pull over at the first spot of rain, says Cameron. To this end, a number of notable features can be seen throughout the interior. Firstly, the seats have no ridges in them, giving a smooth surface so that moisture can be wiped straight off. In place of traditional floor mats, wholly more practical sisal mats are used. Even the carpet itself employs 21st century materials designed to deal with the moisture and humidity encountered in many areas of the world. Integrated seatbelts are mounted directly onto them, while active head restraints and seat squab airbags give further protection to the torso and head. The front seats are slimmer than the Phantoms but still offer an uncompromised degree of comfort. The driving position is set deliberately high to give a commanding view of the road over the long bonnet, and the curved rear lounge seats offer an intimate, social environment for passengers. Rear legroom is excellent and marks the car out as a true four-seater. An exceptional sound system has been specially designed for the Phantom Drophead Coupé, taking into account the differing acoustic properties of the convertible. Nine channels of sound arrive via 15 speakers, creating a stereophonic experience to impress the most hardened audiophiles. The challenge in designing any convertible lies in retaining a high degree of torsional rigidity throughout the body while keeping weight down. Torsional rigidity is vital to minimise the scuttle shake associated with most convertible cars and to help maintain the cars dynamic composure. Extensive testing and research were carried out before the engineering team were completely satisfied. Tens of thousands of kilometres were driven over rough road surfaces to help identify and eliminate potential problems. The result is a spaceframe chassis that makes the Phantom Drophead Coupé perhaps the most rigid convertible available today. The clearest indicator of this incredible strength and stiffness can be seen in the rear-view mirror, which shows no vibration at all, even at high speed. The entire windscreen surround was designed to be an integral part of the roll-over protection system. A great deal of this is due to the modifications around the triangulated A-pillar. Consequently the A-pillar struts run right down to the floor of the car. Additional aluminium extrusions have been utilised, along with wider sills. The rear haunches have single extrusion beams running at waist height on either side. In all, more than 140 metres / 460 ft of weld go into each Phantom Drophead Coupé body 20 mètres / 65 ft more than in the Phantom. Incorporated into the rear spaceframe structure is the concealed roll-over protection system which deploys from within the rear head restraints in just a fraction of a second in the event of an accident. A ratchet system then locks them in place. Further adding to occupant safety, frontal impacts are absorbed by crumple zones directed into Y-shaped chassis members and the main understructure the strongest part of the chassis. Side impact intrusion is minimised by the double-skinned floor construction, strong side sills and integral side impact bars in each door. Additional braces above and below the engine bay and under the rear axle add further rigidity to the spaceframe. Other safety systems include intelligent braking and restraint systems, combined with integral seatbelts. 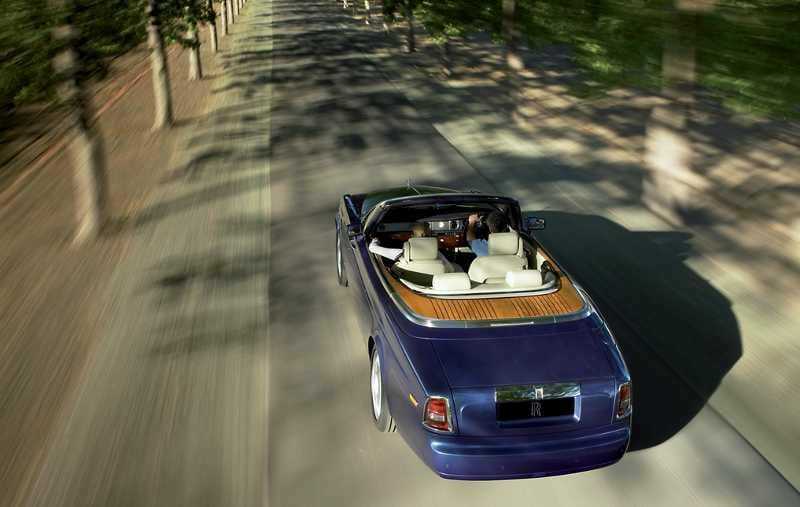 As a result, the Phantom Drophead Coupé is perhaps the safest convertible car on the market. Manufactured to within a tolerance of just 0.1 mm / 0.004 in, each spaceframe is welded entirely by hand. The spaceframe is constructed at the BMW centre for aluminium competence in Dingolfing, Germany. They are then checked by a computer-guided machine to ensure absolute accuracy. One of the more interesting problems encountered by the engineering team was the proximity of the optional brushed steel bonnet to the aluminium front wings. These materials are not normally used alongside each other due to the adverse corrosion effects of aluminium on steel. 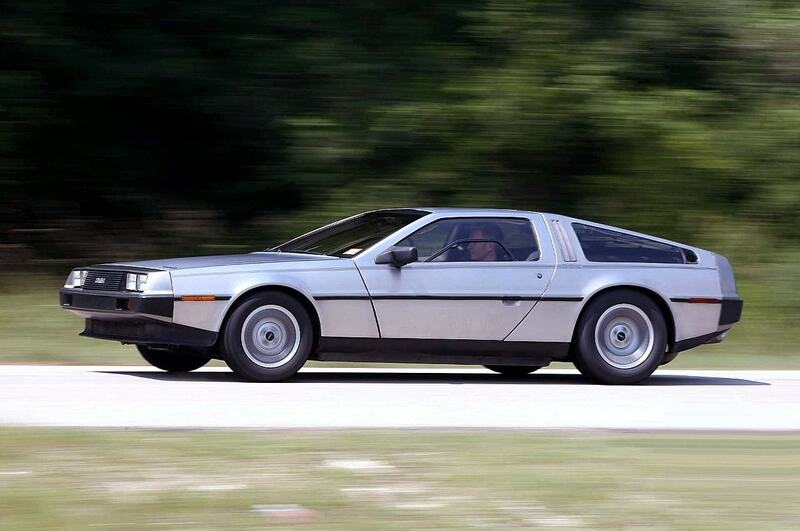 An integral part of the testing process was a 20-year-old DeLorean car. Manufactured with stainless steel exterior panels, it provided an interesting case study into the long-term durability of the material. All of the panels used on the Phantom Drophead Coupé are unique to this car, representing some of the 1300 new parts used. Unlike on the Phantom, the front wings have been constructed from aluminium using the superform technique, in which aluminium is heated to the critical temperature before being literally sucked down over a mould to form the large, complex shape. 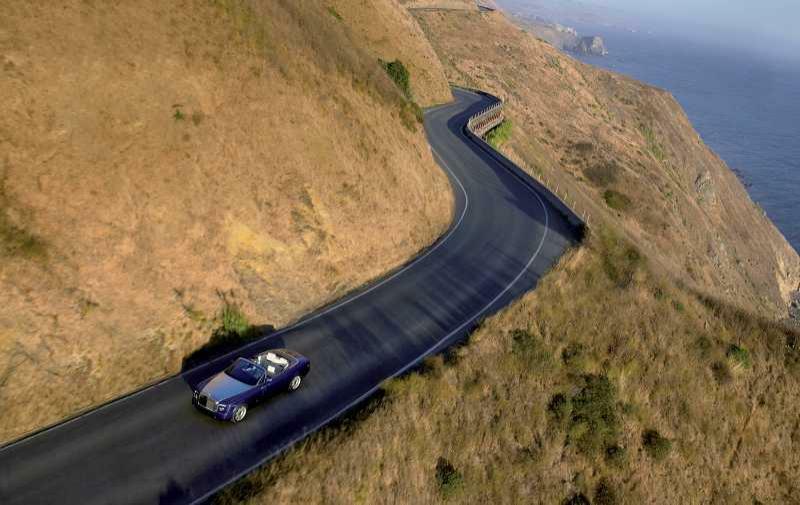 The Phantom Drophead Coupé advanced aluminium spaceframe is at the heart of its refined, dynamic driving experience. Lightweight and exceptionally strong, it impacts positively on ride, comfort and safety. Its inherent rigidity is essential in isolating vibration and maintaining the hushed interior calm associated with the brand. The new car is shorter than the Phantom by 250 mm / 9.8 in, so turn-in is slightly quicker, making for a wholly more agile driving experience. A lower centre of gravity, combined with the reduced wheelbase and incredibly stiff body, produces a ride that is on the refined, comfortable side of sporty. Feedback from the wheels is informative but not intrusive. Imperfect road surfaces go unnoticed while feel through the steering wheel inspires confidence. New spring dampers and lighter anti-roll bars have been engineered to maintain comfort without loss of agility. Self-levelling air struts continuously adjust for increased loading in harder cornering, giving drivers the ability to place the car through turns with absolute precision. Multi-link rear suspension is designed for increased ride comfort with anti-lift and anti-dive technology. The front double-wishbone suspension features a hydraulic mount to minimise vibration through the steering wheel. With no fixed roof, much of the Phantom Drophead Coupé weight naturally sits lower and further forward than in the Phantom, due to the structural roll-over protection built into the A-pillar. Nonetheless, a 50:50 weight distribution has been maintained. Other heavy components the engine, gearbox and propshaft, for example sit as low as possible, again contributing to the low centre of gravity. These tyres enable the Phantom Drophead Coupé to run for at least 100 miles / 160 km at speeds up to 50 mph / 80 km/h before being replaced. Grip is provided by standard-fit Michelin PAX run-flat tyres, metrically sized at 540 mm (approximately 20 inches in diameter). A remarkable level of control still exists, even with a tyre fully deflated. Optional 21-inch wheels with Goodyear run-flat EMT tyres are also available, sitting on nine-spoke rims. The inclusion of run-flat tyre technology removes the need for spare wheels and a jack, freeing up space in the luggage compartment. 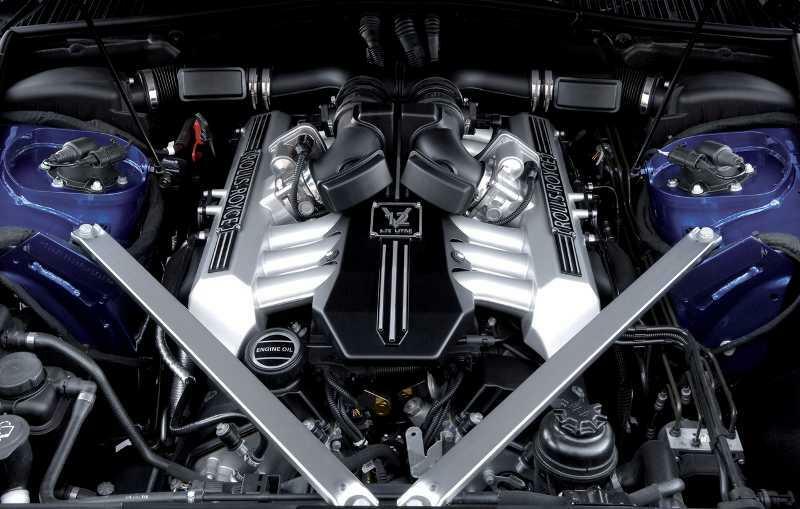 Ample power is supplied by a 6.75-litre, naturally aspirated, V12 engine. 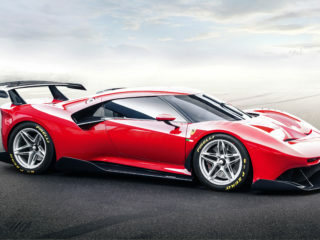 Developing 453 bhp / 338 kW and 720 Nm / 531 lb ft of torque at 3500 rpm, delivery is smooth and abundant. Furthermore, with 75 per cent of engine power available at just 1000 rpm, progress from a standstill is easy and remains so throughout the rev range. The highly efficient unit uses direct injection and variable valve timing. The engine is mated to a six-speed ZF automatic shift-by-wire gearbox. It stops in equally impressive fashion, using 374 mm / 14.7 in ventilated disc brakes at the front and 370 mm / 14.5 in at the rear. The powerful V12 will accelerate the Phantom Drophead Coupé to 60 mph in under six seconds and on to a limited top speed of 149 mph / 240 km/h. Twin piston alloy callipers at the front and single piston callipers at the rear bring the large-diameter wheels to rest. The braking system incorporates the latest four-channel anti-lock system. Emergency Brake Assist steps in under heavy braking, immediately applying full force in an emergency. At rest, an electromechanical park brake can be applied via a button on the dashboard. Final testing was carried out in several locations around the world. The hot-weather tests took place in the stifling heat of Death Valley, USA and the Namibian desert, while cold-weather testing was undertaken in the harsh winter conditions of Scandinavia. Craftsmanship is a hallmark of Rolls-Royce. From the traditional wood and leather workshop skills to the complex welding of the aluminium spaceframe, a 21st century Rolls-Royce is a blend of hand crafted expertise and high-tech materials and techniques. With more than 350 man-hours invested in each car, not including the time taken to build the engine, nearly right is never acceptable. The maxim of company founder Sir Henry Royce still resonates around Goodwood today : Strive for perfection in everything you do. From day-to-day production cars to the often complex Bespoke requests, Rolls-Royce has a skilled team adept at meeting the challenges of crafting the finest cars for the most discerning customers. The skill comes in using each hide in such a way that these natural marks are hidden or discarded, minimising waste and resulting in a perfect finish. For example, a number of the individual leather pieces used in the Phantom Drophead Coupé are larger than those in the Phantom, which makes their selection and usage more difficult because of naturally occurring blemishes and imperfections. Other new materials, such as the teak and brushed steel, bring with them their own unique challenges. Wood is a defining feature of the Phantom Drophead Coupé, and the woodshop team can spend up to a month preparing, matching, shaping and finishing each cars set. The teak deck is finished with a specially formulated oil blend to ensure a rich, natural, longer-lasting lustre. 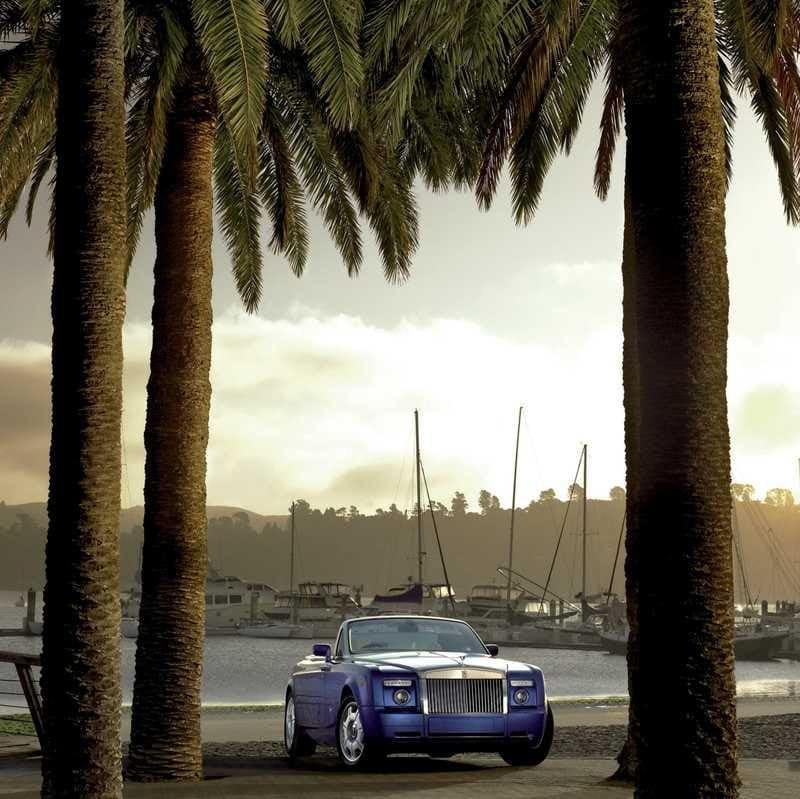 Its use on the Phantom Drophead Coupé is unlike any other in the automotive industry. With the brushed steel, the difficulty lies in getting exactly the same look to each of the parts the grille, the bonnet and the A-pillar. After a great deal of research and testing, machine-brushing finished by hand-polishing was deemed the best way of achieving a uniform grain. Craftsmanship can be found throughout the Phantom Drophead Coupé, from the largest, most visible parts down to the smallest, unseen detail. By constructing each car with the same enthusiasm and passion with which it was designed, Rolls-Royce ensures that each one will offer a unique motoring experience, both to its owners and to all those who will travel in it.